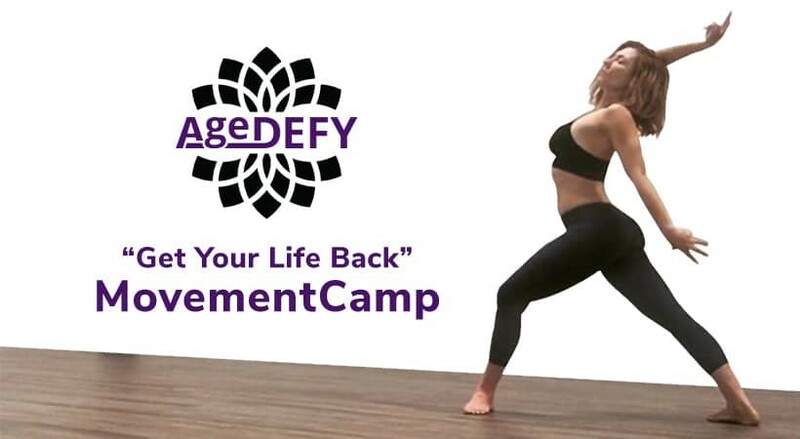 AgeDEFY is a 90 day Movement Therapy program designed by Dawnelle Arthur who, at the age of 42 years old, was told she needed a total hip replacement of her left hip. After spending a few months feeling sorry for herself, she got up and decided to get her life back. After 20 years of teaching, I was told to get another career. After 12 years of hiking 14’ers, trail running, snowboarding, adventure racing, mountain biking, 2 triathlons and a half-marathon, I was told I would never hike or run again and that it was time to take it easy. This was the end of life as I had known it for so many years as a yogi and adventure athlete. But I decided to not take my Doctor’s advice. Instead of taking it easy, I stayed working as a studio owner, trainer, coach and teacher. I kept teaching 10+ classes per week. I kept adventuring, and I did it all because of AgeDEFY. The Doctors told me I was too young to have the hip replacement and that I needed to use conservative measures to prolong the surgery for as long as I could. The conservative measures were prescription medications and changing careers to a sit down job. When asked how long I should wait for surgery, they told me I would progressively get worse and that I should wait to have the surgery when I could no longer sleep because of the pain or when I could no longer do everyday activities such as go to the grocery store or to church. The news devastated me. I did not want to live miserable. This is why I created AgeDEFY and this is how I managed to get my life back. Three years later, I’m still teaching, still creating, still hiking, and still living an adventurous life. I will have the surgery one day soon, but, grateful for AgeDEFY, I’m not living miserable and I’m still in the career that I love so much. My hip injury devastated me; my Doctors scared me, and AgeDEFY saved me. So Back to the question …. What is AgeDEFY? AgeDEFY is a 90 day Movement Therapy program that uses movement as medicine to help you live a stronger, healthier, more youthful life for longer! Get Your Life Back … DEFY Age. DEFY Injury. DEFY Pain. DEFY Limits. Do I have to be 40 years or older to sign up? AgeDEFY is for the inured mover and the aging body. If you feel older than your age, do AgeDEFY. If you’re over the age of 40, do AgeDEFY. If you’re in pain, do AgeDEFY. If you’re sick and tired of feeling stiff, do AgeDEFY. If you want to try something new like yoga or a bootcamp class or if you want to do a 5K family run this year or do a hike with friends, do AgeDEFY. If you want to live younger for longer, do AgeDEFY. This is how I feel about AgeDEFY. It doesn’t matter your age, it only matters how you feel. If you feel older than your age, sign up for AgeDEFY. Sign up for the 90 day program. Once you’re signed up, you will receive a welcome email with a link to join the AgeDEFY FaceBook group and a link to purchase your AgeDEFY home studio equipment. Start anytime! No need to wait for a start date, now you can begin whenever you want! Click here for more information on how the AgeDEFY program works. Follow the AgeDEFY Movement Presciption from day to day for the best results. Click here for more information about each phase. How much is it to sign up? The cost $299 for the 90 day program. The cost of the program includes unlimited access to the AgeDEFY workouts in Phase 1–3 for 90 days. After 90 days the subscription fee is $14.99 per month. The subscription fee includes unlimited access to the workouts for the length of your membership. No contracts. Cancel anytime with a 30 day notice. You get 90 Days to Complete the program. The goal is to finish in 90 days but if you don’t, then you can sign up for the AgeDEFY subscription membership for $14.99 per month until you finish. You can also sign up for the AgeDEFY subscription membership if you want to keep doing the program after 90 days. The best way to keep going is to keep going. The more you move the better you feel. Repeating the program is the best medicine. In 30 days you’ll move better. In 60 days you’ll feel better. In 90 days you’ll be living young and feeling great! Repeating the program keeps the ball rolling. The more you move the better you feel. The better you feel the younger you live! This is AgeDEFY! What are Movement Therapy Clinics? Movement Therapy Clinics are live sessions with Dawnelle every Sunday morning at 9:30am (MST) on the AgeDEFY group page. The Clinics are taught for the group and are based in BodyKnowledge and practice. No matter where you are in the AgeDEFY program, the live clinics are your chance to be with me in real time. The Clinics give me the chance to connect with you during the program. It’s hard to do exercise/health programs online, and I totally understand the feeling of signing up for an online program and not finishing it because of lost motivation. This is why you join me for the weekly clinics, and this is why you participate in conversation within the group. You are not alone. You have access to me at all times, and you have a group of people who are all in this together. The Clinics are personal training and physical therapy in one session. Don’t miss them. But if you do, no worries. You can watch them anytime on the group page. Once you’re in the AgeDEFY FaceBook group, you’re always in the group. This is just another reason why you should sign up for the AgeDEFY program. Give it 90 days. AgeDEFY is an amazing community and we can’t wait for you to join us! What is “New Movement New Results”? Only when the mind and the body are challenged with a new task, can change occur. If you want new results, you have to try new movement. If you’re stuck on being sad about an injury that took you out of the activity you love to do the most, you need new results. You need new thoughts. The only way to disrupt your current situation is to create movement chaos. New movement begins as chaos. You don’t know how to do it so it feels weird; it feels chaotic and it will frustrate you. We call it “working the wobble” and it works! We as humans get comfortable in our movement habits, and by doing so the body (and the mind) become less active. Even if you’re active, if you do the same kind of workout or movement pattern day after day, the body is not as active as you think. The movements have become comfortable, which means they have become mindless. When the mind and the body become less active in active environments, the risk for injury can increase and the results you once had remain the same. If you want new results, then you have to try new movement. When you experience new movement, you’re constantly being challenged. When you’re challenged, the mind wakes up, the body gets stronger, and you get the opportunity to become the next best version of you. What is “Repeat and Get Better”? Repeat and Get Better workouts are workouts you repeat. Every time you repeat a workout, you get better. When you move well, you feel good. This is why we repeat them. Everyone is a beginner in AgeDEFY. The workouts and the movement approach is new to everyone who have not practiced with Dawnelle. You could be an amazing yoga student, but struggle with the movements of AgeDEFY. You could be an endurance athlete and still struggle with AgeDEFY. The AgeDEFY movements are designed to reveal all. They are designed to uncover weaknesses in movement habits. If you lack the ability to internally rotate your shoulders, then you need AgeDEFY. It’s a weakness that needs to be exposed, and, once it is, then you will know. You will know what you need to do for you and you will know how to improve the health of your body. There are no beginners or masters in AgeDEFY, it’s a program that works for your body. It’s designed to teach you about you. There will be things you can do and things you can’t do. You just keep doing them until you can. Do I have to have an injury to sign up? All of us have an “injury” … It could be tight shoulders to weak ankles to needing a hip replacement. We are all injured in our own way. And maybe you’re not injured, but you’ve turned 40 or 50 or 60 and you realize that now is the time to start thinking about your future self. You’re here reading this for a reason … It’s time to get moving and grooving again! It’s time to live the rest of your years strong, energized, and feeling youthful. You don’t even have to have a reason to sign up for AgeDEFY. You can sign up just because you’re looking for something new to do. Or sign up because you don’t live close to a studio or gym, or maybe it’s winter and you don’t want to get outside. Whatever the reason, it’s a good reason.